Yay!! Today's is World Pharmacist Day and i am so proud to be a member of this Noble profession. Pharmacy totally rocks!! Just have 2 things to say: When getting your drugs filled remember that 1. the pharmacy ain't a fast food restaurant so calm down and let the pharmacist do his or her job, it is for your own good. 2. One mistake by the pharmacist can kill you. So be extremely nice to your pharmacist cos you don't want a pissed off pharmacist handling your drugs. 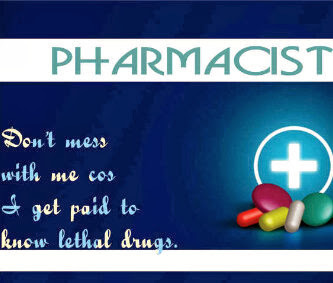 A pissed off pharmacist is a deadly, very deadly pharmacist........lol. Show some love to Pharmacists everyday guys..
Gotta run. I need to sleep early this night. It is good to see the booming industry where youth are getting good jobs in this world once they complete there education. We provide housekeeping And Gardening services both for big and not-so-big companies in and around Hyderabad. excellent information.It is to share and is very useful for not only me and also all people.It is the wonderful blog. Thanks for posting this informative article with smart and cute content.. There are advantages to working in Healthcare System instead of a retail domain. Stable working hours - Pharmacists in an intuitional setting will work the ordinary measure of hours however might be required to work nighttimes, evenings and ends of the week as drugs are required day and night.I find a very good website for the Health Conditions, If you want you can visit this site. Its aggregate is a all-inclusive API affiliation adjustment which allows it to board anon into the assorted "cloud" VPS providers. Companies like Microsoft, Rackspace, DigitalOcean and others all board simple API's which gives the appliance the adeptness to affix to a user's annual on their provider of choice, and set up servers as required.